Language learning is often at the forefront of teaching and tech innovation because languages are relatively easily codified, somewhat difficult to learn and of global interest. iKnow, demoed today at AsiaD, aims to be just such an innovator. The product was billed as a “personal learning assistant” that calculates an individualized study schedule based on a user’s learning and retention patterns. Algorithms determine the best order in which to learn a set of “items” (a foreign word or phrase, for example), and, more important, the best time for the user to review the items already learned. “Research has shown that there is an optimum moment to review whatever you’re studying, and that moment is right before you’re likely to forget it,” said Andrew Smith Lewis, co-founder of iKnow developer Cerego. 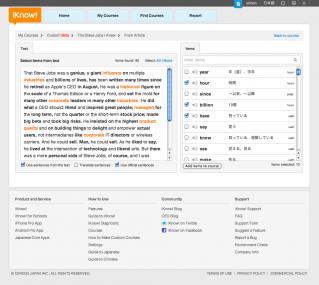 iKnow hopes to take the guesswork out of the equation and tell students exactly when their brains are primed for a review. 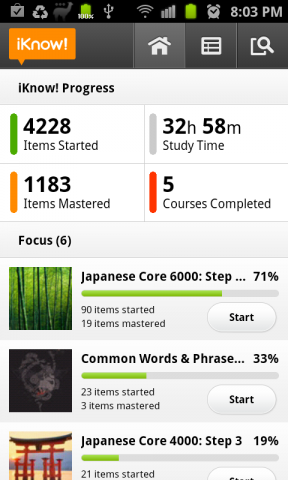 The user interface includes a dashboard with each of the student’s classes, as well as study targets, progress trackers and an upcoming study schedule. Students can turn on email study reminders to avoid falling behind. Optional Android and iPhone apps can sync with the user’s computer. The company’s demo unveiled its latest development, a text-parsing tool that will allow users to capture content from blogs or articles and use that text to customize a learning session. The program extracts the most important words in the article and adds them to the user’s study list. It’s currently aimed at English-learners in Japan, but also offers an extensive core of Japanese-language instruction and a nascent Chinese core. Businesses and schools can sign up for a subscription service that allows a group of students or employees to interact in a given class. And therein lies perhaps the most useful feature of iKnow: Administrators can get access to analytics showing the progress of individual students and the entire group. This could help teachers get beyond blank stares to see which concepts students are grasping and which segments may need more time. Video and photos from the demo below.